← Tromso, Norway: I’m Back! My October 16, 2018 blog started with an ostrich burying its head in the sand; I talked about state legislations that did not allow for serious consideration of climate change, sea level rise, or assured water supply when granting construction permits. As I promised last week, I will refocus here on our deliberate collective blindness to the dangers currently facing our permafrost. The January 15 blog this year featured a global map of the extent of permafrost melting caused by climate change. The Bureau of Land Management is rewriting a 2013 plan, with the aim of opening up previously protected lands on Alaska’s North Slope. Permafrost is a permanently frozen layer below the Earth’s surface. It consists of soil, gravel, and sand, usually bound together by ice. Permafrost usually remains at or below 0C (32F) for at least two years. 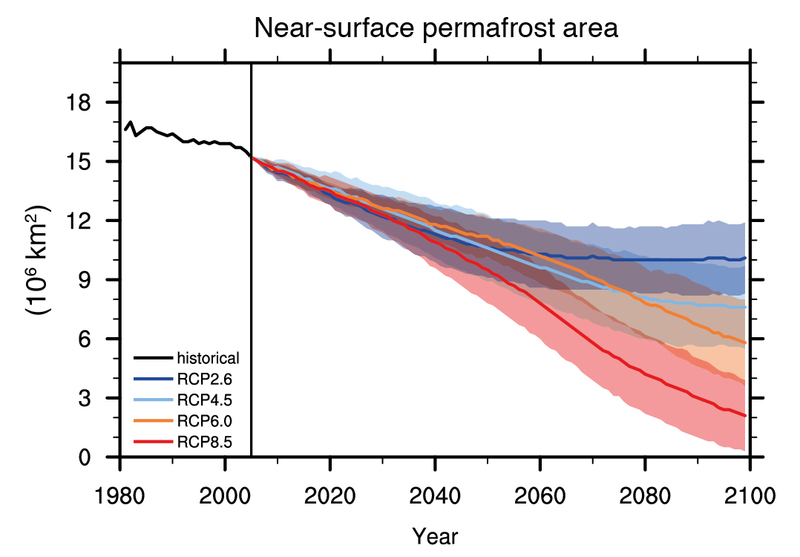 The figure below shows the near-surface permafrost area as a function of various future socio-economic scenarios laid out by the IPCC. In a business as usual scenario, continuing our current practices, permafrost is projected to disappear (melt) toward the end of the century. The starting point in this IPCC figure consists of about 13% of the global land (taken as 130 Mkm2). Permafrost thawing is a vital issue especially when you are trying to construct essential infrastructures such as buildings and roads on top, often without sufficient research as to the nature of the land that you are building on. But collapse is not the only threat. Permafrost warming also has the potential to amplify global climate change, because when frozen sediments thaw, they unlock organic carbon from the soil. Almost every known permafrost site throughout the world in which a borehole was drilled and the temperature was systematically measured over the last 30 years or so, has shown a constant increase in the temperature of the layer, steadily approaching the melting temperature (see “State of the Climate in 2017” by the American Meteorological Society – fig. 2.11). As we traveled, we inquired about problems with the local permafrost. Unsurprisingly, for people in Tromso and around Lulea (see the previous two blogs) it was not an issue but around the high mountains—in Kilpisarvi, Finland where we took the beautiful pictures of the aurora borealis (last week’s blog), in Jukkarsajarvi, Sweden where the Icehotel is located (more on that next week), and in the ski resort of Bjorkliden—it is a big issue. To get some sense of the enormity of this important consequence of climate change I will finish this blog with excerpts from two short pieces. The first is taken from the same site as Figure 2 and focuses on Scandinavia; the second concerns Russia—the country that at least until now has led all attempts to build on top of permafrost. New research shows in greater detail which parts of Scandinavian earth is permafrost. A more alarming challenge has recently arisen in the High North. Global warming may destabilize the mountains of Scandinavia as it progressively thaws the permafrost that binds them together. Unstable mountain slopes threaten roads, railroads, buildings, and lives. Moreover, thawing of the permafrost areas of the marshes of the High North may release enormous quantities of greenhouse gasses. The contribution from Scandinavian marshes is small compared to the contributions from the far larger marshes of Siberia, Alaska, and the Yukon. But it’s a substantiated threat, as clear signs of the degradation of Scandinavian marshes have been observed over the past 50 years. The challenge then is to understand how permafrost in mountainous areas will respond to future climate change. Increases in air temperature have occurred in most parts of the Arctic in recent decades. 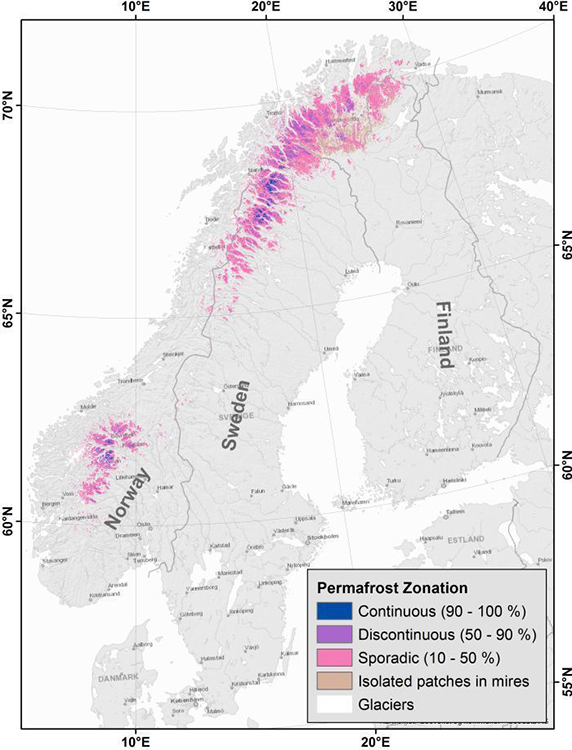 Corresponding changes in permafrost and the active layer have resulted in decreases in ground-bearing capacity, which may not have been anticipated at the time of construction in permafrost regions. Permafrost model was coupled with empirically derived solutions adopted from Soviet and Russian construction standards and regulations to estimate the bearing capacity of foundations under rapidly changing climatic conditions, in a variety of geographic and geologic settings. Changes in bearing capacity over the last 40 years were computed for large population and industrial centers within different physiographic and climatic conditions of the Russian Arctic. The largest decreases were found in city of Nadym, where the bearing capacity has decreased by more than 40%. A smaller, but considerable decrease of approximately 20% was estimated for Yakutsk and Salekhard. Spatial model results at a regional scale depict diverse patterns of changes in permafrost-bearing capacity in Northwest Siberia and the North Slope of Alaska. The most pronounced decreases in bearing capacity (more than 20%) are estimated for the southern part of permafrost zone where deformations of engineering structures can potentially be attributed to climate-induced permafrost warming. Climate change may, however, have already been taking its toll through deformation of engineered structures in Arctic regions. A survey of infrastructure in industrially developed parts of the Russian Arctic (Kronik, 2001 Kronik, Y. A. , 2001: Accident rate and safety of natural-anthropogenic systems in the permafrost zone. In Proceedings of the Second Conference of Russian Geocryologists , 4: 138–146. [Google Scholar]) indicates that 10% of the buildings in Noril’sk, 22% in Tiksi, 55% in Dudinka, 35% in Dicson, 50% in Pevek and Amderma, 60% in Chita, and 80% in Vorkuta are in potentially dangerous states. Analysis of related accidents indicates that in the last decade they increased by 42% in the city of Noril’sk, 61% in Yakutsk, and 90% in Amderma. In next week’s blog I will try to extract some useful information from the most unique Arctic living (or tourist) structures that might be useful in the global adaptation to a changing global climate. This entry was posted in Anthropocene, Anthropogenic, Climate Change, Extreme Weather, IPCC, politics, Sustainability and tagged Adaptation, alaska, Anthropocene, Anthropogenic, Arctic, arctic circle, arctic ice, arctic melt, bearing capacity, BP, climate, Climate Change, Climate Change Denial, climate change denier, climate skeptic, Donald Trump, drilling, Environment, Finland, Future, Gas, governance, Government, Infrastructure, IPCC, melt, Mitigation, Norway, Oil, Permafrost, Prediction, protection, regulation, Russia, Ryan Zinke, scandinavia, scenario, Sweden, thaw, Trump. Bookmark the permalink.